Minnesota's three major U.S. Senate candidates spent part of their first debate accusing the other of misrepresenting their positions on important issues. Republican Sen. 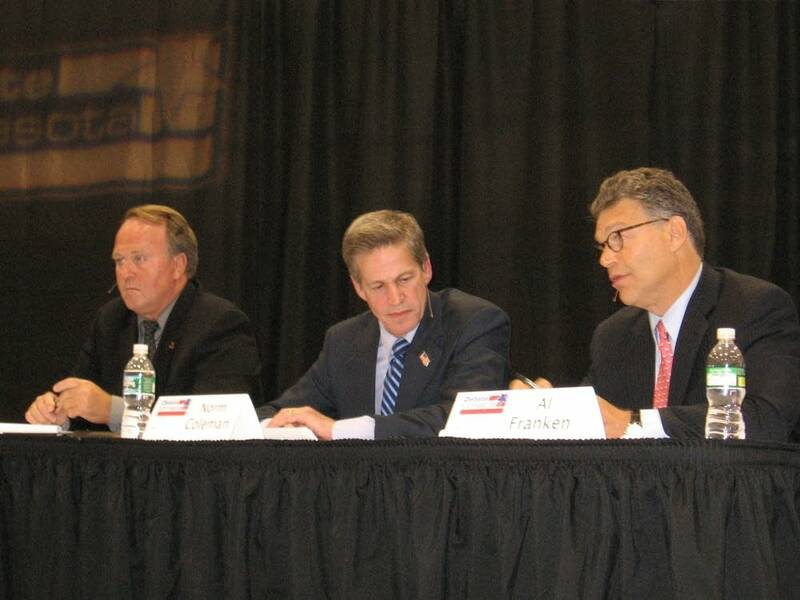 Norm Coleman, Democrat Al Franken and Independence Party candidate Dean Barkley were in Rochester, Minn., last night for a forum sponsored by Debate Minnesota. The three candidates talked and sometimes argued about the economy, energy and foreign policy, along with a myriad of other issues. Not surprisingly the first topic of discussion at last night's debate was the Wall Street bailout package that Congress passed last week. Democrat Al Franken, the only one of the three who opposed the final package, criticized the bailout for not addressing the housing crisis head on and for failing to place new restrictions on Wall Street. "This bill did nothing to reconstruct the regulatory framework that was dismantled. It did nothing to erect new framework for the new kinds of financial packages that made us go under. This whole thing reminded me of the rush to war in Iraq," said Franken. Republican Sen. Norm Coleman called the nation's economic challenges the worst he's seen in his three decades of public service. And while Coleman did vote for the final bailout package, he did not oversell it as any kind of long-term solution. "Right now we are simply stopping the collapse; that's what this is doing. We've got a lot of work to do to get this economy moving again," said Coleman. Independence Party candidate Dean Barkley used the passage of the bailout as a moment to criticize both of his opponents. "Where were our elected officials for the past six to eight years? And I will blame Norm for that. This happened on his watch," said Barkley. Barkley said he decided the bailout was necessary, because he was convinced that without it the credit markets would dry up and strangle the economy. "It's very easy to sit, as Al did, and I'll throw a shot in for waiting until the thing was over and the vote was in to take a position on this," said Barkley. "It wasn't an easy thing to do, to come out and say, even though it went against everything that I thought we should do. I didn't want to bailout anyone. If we did not do this, Main Street could have been devastated and we could not let that happen." As Barkley, Coleman and Franken talked about the issues about 1,000 people looked on from bleacher seats inside the Rochester Community and Technical College Sports Arena. Most of the attendees were there to support a particular candidate. Still, for the most part, the crowd heeded the moderators instructions to refrain from applause. Asked what they would do to stem job losses throughout the nation, the candidates began focusing on energy policy. Barkley said the economy can't rebound until energy costs go back down, and he called for a push to ween the U.S. of its dependence on foreign fuel. Coleman brought up the bailout again and noted that it included alternative energy incentives, incentives that would not have gotten Franken's vote. "You can talk about wind energy, but you got to act, and had we followed Mr. Franken's lead, had the Congress followed that lead, that would have been a spike through the heart of the wind energy business in this county, because it contained the investment tax credit that wind energy needed to keep producing," said Coleman. Coleman also underscored incentives for solar energy producers that were tacked on to the bailout. Franken accused Coleman of previous votes against wind and solar tax credits. In addition, he reiterated his criticism over how Congress decided to load up the bailout with unrelated measures in order to get the bill passed. "The bailout bill had to stand. It was too big and too important to have to be larded with all of these other bills. It's too big and too important not to be able to stand on its own," said Franken. "Of course, I've been talking about jump starting these industries years and years and years ago while Norm Coleman wasn't doing anything about it." The candidates also talked about foreign policy. Franken called Iraq a horrible mistake that distracted from how the war on terrorism should have been waged. "We need to be putting the focus back on the people who attacked us, and the people who attacked us are along the Pakistan border, the Pakistan-Afghanistan border in the tribal areas. They're Al Qaeda, and that's the tragedy of taking our eye off the ball in Afghanistan," said Franken. Barkley said there was no issue where disagreed more with Coleman than Coleman's support for the Iraq war. "I think that was his first trillion dollar mistake, and the second was his failure to watch over the financial industry, so that's your second trillion dollar mistake," Barkley said of Coleman. "My question to you is how many more trillion dollar mistakes do we have to put up with?" Coleman talked about progress against Al Qaeda in Iraq. Coleman said he also wants the troops home quickly, but not in a way that would require them to have to return to Iraq. 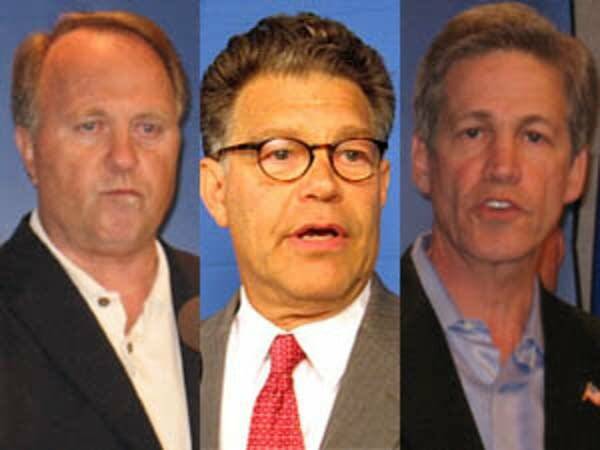 Coleman accused both Franken and Barkley of supporting calls to cut off funding for the troops. "I'll tell you how proud I am of making sure that we're voting to fund our troops. Where I disagree with Mr. Franken and disagree with Mr. Barkley is decisions to cut-off funding," said Coleman. Both Barkley and Franken took issue with Coleman's accusation. "I never suggest cutting off funding for our troops," said Franken. Franken leveled the same charge back at Coleman. "Norm Coleman is the only one on this platform who's voted to cut off funding for our troops when he voted against a bill that had been passed in Congress to have a time line," said Franken. Dean Barkley said that he has never called for cutting off funding for the troops. "First thing: I've never ever said I'd cut off funding for our troops. If you can tell me where I've ever said that, I'll give you 100 bucks. Never done that," said Barkley. "Our troops have been superb. I couldn't be more proud of our troops, but darn it, the best thing that we can do for our troops is to bring them home. That's the best thing that we can do for them." 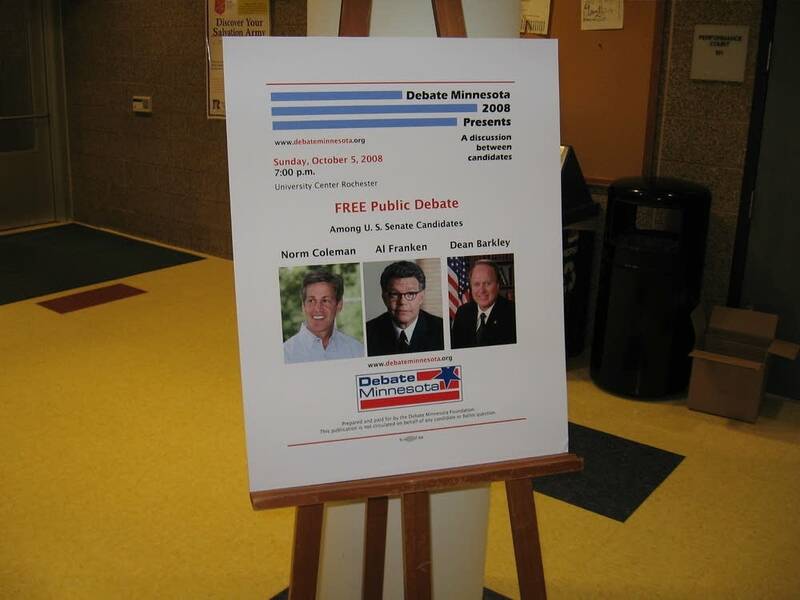 Throughout the debate Coleman sought to distinguish himself from Franken and Barkley as the candidate with a long record of public service. Barkley brought up his accomplishments as part of Gov. Jesse Ventura's administration and his brief time in the U.S. Senate when Gov. Ventura appointed him to fill out the remainder of former Senator Paul Wellstone's term following Wellstone's death in a plane crash. Franken noted that as a radio talk show host he was instrumental in getting tens of thousands of much needed helmet liners to Marines. During the final portion of the debate, the candidates fielded questions from the audience. One of the questions posed to the candidates focused on the campaigns commitment to civility in their campaign commercials. Barkley called the attack ads an embarrassment, but he conceded the nasty tone the race has taken was helping his efforts. "I really have to thank them both for doing it right now, because I think I have been the beneficiary of their negative ads, because you're driving people to me so keep on doing it," said Barkley. Franken and Coleman defended their ads and accused each other of misleading voters. "There's an ad that says I assaulted a heckler. I didn't assault a heckler. A heckler heckled John Dean at a rally and started charging the stage, and I helped grab him, and he was taken out of the theatre. I was later given a key to the city," said Franken. Coleman likewise attacked Franken's ads about his record. "They're got one [that says] Coleman voted for tax breaks for big oil. It's the same bill that Barack Obama voted on for and Mark Dayton voted for," said Coleman. The Rochester debate was the first of five debates that the candidates have agreed to participate in between now and the November election. The next debate is Saturday night, Oct. 11, at Breck School in Golden Valley.